You probably think I’m pulling your leg. I know I took a few liberties with my Creepies and Crawlies post and blurred the line between fact and fiction, but I swear that Aussie magpies in spring will make a grown man squeal like my little nieces (yes you Lilly, Amy and Kelsey!). You see, snakes and spiders don’t attack you. They prefer to be left alone and won’t harm you unless they are threatened. Even then, you would be incredibly unlucky to actually be hurt. Magpies however are very protective of their baby chicks in spring. They feel threatened if you are anywhere near their nest. 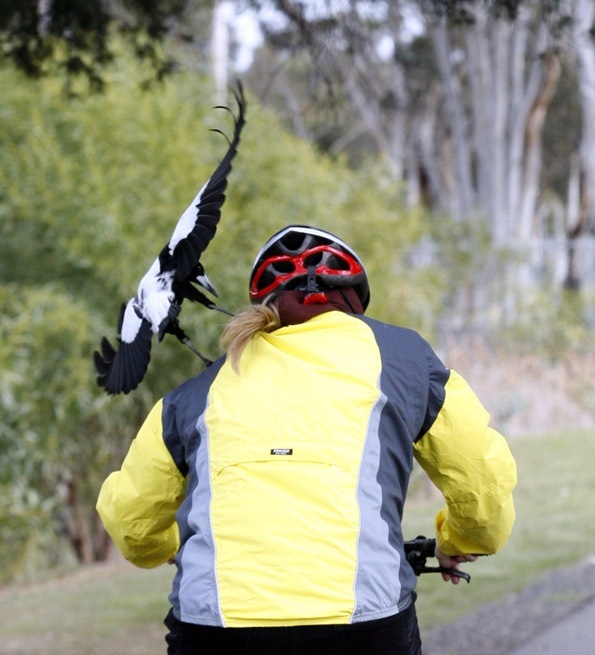 If you are unlucky enough to be walking or riding a bike within 100 metres of their nest you may get swooped. Trust me – this is terrifying. Imaging riding along happily when all of a sudden you sense something coming at you fast from overhead. The next thing you know something has hit your helmet. The magpie flies off, only to come swooping back with its beak snapping for another attack. And another one. And another one. Sadly, there have been cases of kids being blinded by attacking magpies or some who have been hit by cars while trying to get away from the attack. 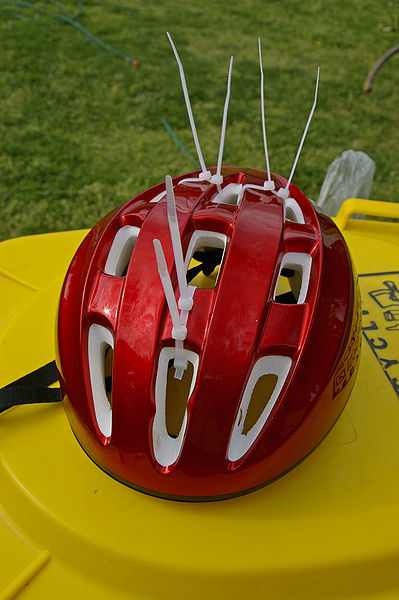 While it might look a bit strange, many cyclists put cable ties on their helmets, sticking out at all angles so that the magpie can’t get close enough to make contact with them. The strangest, and seemingly most effective thing I’ve ever seen to deter a magpie attack is an afro wig!! I’m not kidding. Have a look at the clip below and see how different magpie helmet adornments fare, including the afro wig. This entry was posted in Dangerous Australian animals and tagged aussie, australia, dangerous australian animals, magpie, magpie swoop, swooping magpie, travel, writing. Bookmark the permalink. Ha ha! Yes good old Queanbeyan is now famous!!! Oh how true!! They really can injure people during spring, so I keep on my guard, because if a magpie is likley to swoop they scare me too. I love the idea about the afro wig, very funny. 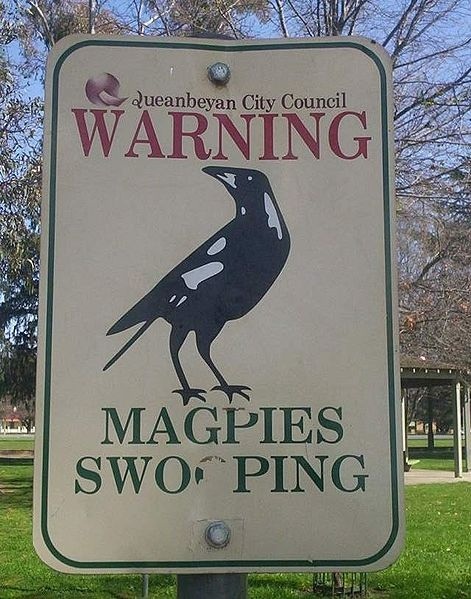 In high school my girlfriend was swooped and the magpie cut right through her nose! This has given me magpie phobia ever since! Terrifying. Very scary! Well justified magpie-phopia! The things we do in the name of science! Good onya Dave, taking one for the team like that! Absolutely!!! Dedicated scientists have no fear for their own safety. Especially when they are with a group of buddies. Kiwi living in Canada. Stumbled across your blog once again while seeking differences between us – oh aren’t there many! 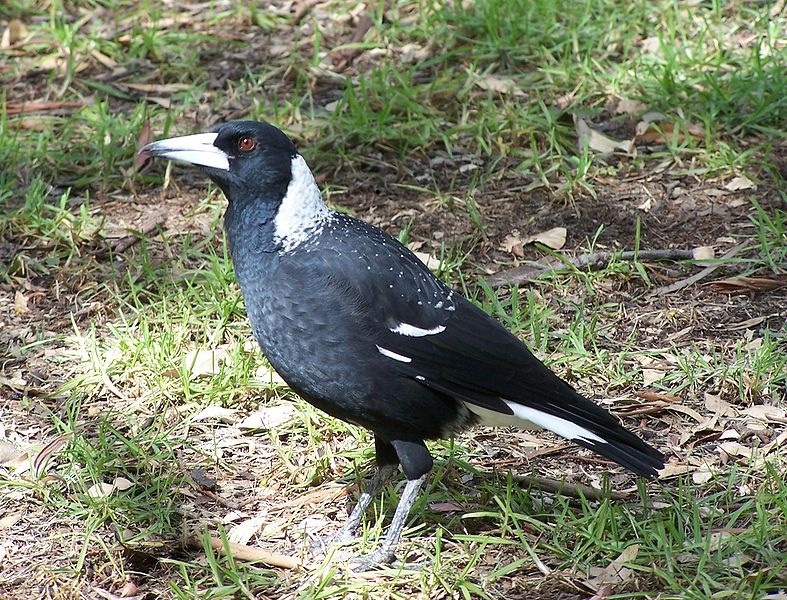 But this article on magpies… Holy Moly. I got swooped while training for a road race, it threw me off my bike, and I broke my collarbone. Have not been able to face a magpie since without hyperventilating. Arrive in Canada to find magpies are twice the size! But fortunately called ravens and never swoop! Took me a while to trust them, but what a relief. Thanks for visiting and commenting Christina. I don’t think you understand what the big deal is until you have been swooped.